If you choose to vaccinate your child according to the CDC's recommended schedule, there are a few things you should know. You should know that your child will be injected with 115 vaccine antigens between birth and 2 years. You should also know that this has never been studied for safety or efficacy. Not once. In other words, the CDC (and your doctor) has no idea if this practice will kill your child, or if this practice will prevent ANY disease, because there has never been a single study done to investigate how the body responds when individual vaccines are combined this way. Educate before you vaccinate. Source: CDC Recommended Immunization Schedule. Hear Marcella Piper-Terry speaking about the serious vaccine adverse reactions in herself and her daughter in this 20 minute interview by Vaccine Rights Attorney Alan Phillips. After much research, Marcella eventually recovered her daughter using a bio-medical protocol, and went on to create VaxTruth.org to let parents know that vaccine exemptions are available for school, and that there is a large amount of science documenting the harm from vaccines. Marcella's older articles are available at 4allofyou.blogspot.com. 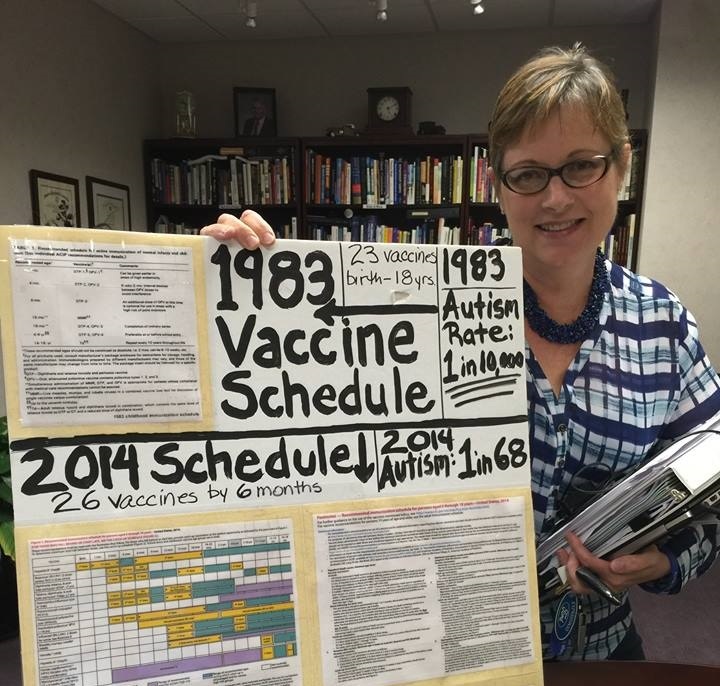 Close to 5 years ago, I began researching vaccines because I knew things had changed a great deal since I was young. We all had chicken pox, measles, mumps, rubella, etc., as kids. No one feared these things. They were a right of passage. You stayed home from school, got spoiled, watched cartoons and went back to school and that was that. We also didn't have peanut allergies, or autism or diabetes. As a child, I knew of no one who had any if these illnesses. I think we received about 4 vaccines in my generation. I began to realize that todayÂ’s children receive a lot more, but I didn't realize how many. I learned: 69 doses of 16 vaccines before age 18. Including a Hep B vaccine on day of birth in most hospitals. Outrageous. A picture started to form while I was doing this research. A very clear picture that was at the same time, very disturbing. This is not a conspiracy. This is a fact that is admitted by doctors, the package inserts and the manufacturers themselves. Children die after vaccination. A lot more often than you would imagine. I know that with every "medicine" there is risk. The benefit should offset the risk. None of these childhood illnesses were worrisome when I was young. When you vaccinate, you take the risk of lifelong chronic illness, or even death. A big price to pay, to avoid a mild childhood illness that gives you lifelong immunity. Read about them. Understand them. It's no wonder so many children die and are injured. Read the inserts too. I learned a placebo isn't a placebo when it comes to vaccine studies. I learned that the studies are not independent. I learned that nothing is what I thought it was. The vaccine industry has long known the harmful side effects and are indemnified from any harm they cause. Some of the things that have happened are downright criminal, but no one will step in and prosecute. Wyeth Internal Memo: One of the Sickest Examples of Vaccine Industry Corruption. There is no advance warning for vaccine injury. It doesn't matter if you selectively vaccinate, get one vaccine, delay, etc. You have no way of knowing in advance if your children will be injured. If you are holding your breath and praying when you vaccinate, you shouldn't be vaccinating. You are in no rush. Take all the time necessary to learn everything you can so you can make an informed decision. Doctors don't know what is in a vaccine, what isn't in a vaccine, what an injury looks like or how to report them. Most doctors, according to some research, don't even vaccinate their kids on schedule. Most doctors aren't "up to date" on their own vaccines. Most doctors don't understand the history of herd immunity and how it does not apply to vaccinated populations. They don't understand anything outside of what they have been taught by their pharma-funded schooling. The AAP, which is where pediatricians get all their information, pushes pediatricians to have their patients vaccinated and the propaganda is extreme. Many peds are not seeing patients who don't vaccinate. FINE. They work for you and not vice versa. Find a family doctor or a DO or a chiropractor or an ND to see you and your kids. Most don't push vaccines because they don't have the AAP breathing down their necks. Most kids donÂ’t need medical care anyway. "Well visits" are vaccine visits. Exemptions exist in every state. Some states are more difficult than others, but they exist in every state. Yes, we have been told that vaccines eradicated polio, small pox, etc. I have learned there is so much manipulation, it's hard to know exactly what happened with polio, but it's very clear that vaccines didn't eradicate it in the U.S. or in any other country. In fact, there is plenty of evidence vaccines have caused polio many times, in the U.S. and in other countries. Looking at the history of disease and mortality rates before and after vaccine was mind blowing. Study, read, research, ask questions, talk to other parents, read everything you can get your hands on. Then make a decision. DonÂ’t let anyone make your decision for you. It's your child, your choice. 1. IF YOU WANT TO END THIS INCREASINGLY HEATED CONTROVERSY, THEN PROVE TO US VACCINES ARE SAFE. Why hasn't there ever been an independent study comparing the health outcomes of fully vaccinated children and never vaccinated children? If, as everyone is telling us, many parents are exempting their children, then the study group is out there. Health officials do retrospective studies like this all the time, why hasn't this research been done? Do never vaccinated kids have the same rates of autism and chronic illness that vaccinated ones do? This should be over concern to everyone. Unless and until such a study is done, the question remains open. 2. WHY IS THERE NO MENTION OF THE FACT THAT THE VACCINE SCHEDULE HAS MORE THAN TRIPLED SINCE 1983 WITHOUT A SINGLE STUDY ON THE CUMULATIVE EFFECT OF SO MANY VACCINES SO SOON ON THE HEALTH OF A BABY? 3. WHY IS THERE NO CONCERN OVER THE FACT THAT OUR CHILDREN ARE THE MOST VACCINATED KIDS ON THE PLANET AND SOME OF THE SICKEST? FURTHERMORE, WE HAVE THE WORST INFANT MORTALITY RATE AMONG ALL THE DEVELOPED COUNTRIES. Look at this Washington Post article from 2014, Our infant mortality rate is a national embarrassment. 4. WHY ISN'T THERE MASSIVE MEDIA ATTENTION BEING GIVEN TO THE FACT THAT 50 PERCENT OF AMERICAN CHILDREN HAVE SOME KIND OF CHRONIC HEALTH CONDITION? Mainstream medicine and health officials continue to scratch their collective heads over two percent of children with autism and the soaring rates of diabetes, seizure disorder, life-threatening allergies, asthma, and bowel disease. Stop asking why parents don't vaccinate. It's the wrong question.